Unless you’ve been under a rock or you live in the Southern hemisphere, you probably know that wild garlic is currently in season. 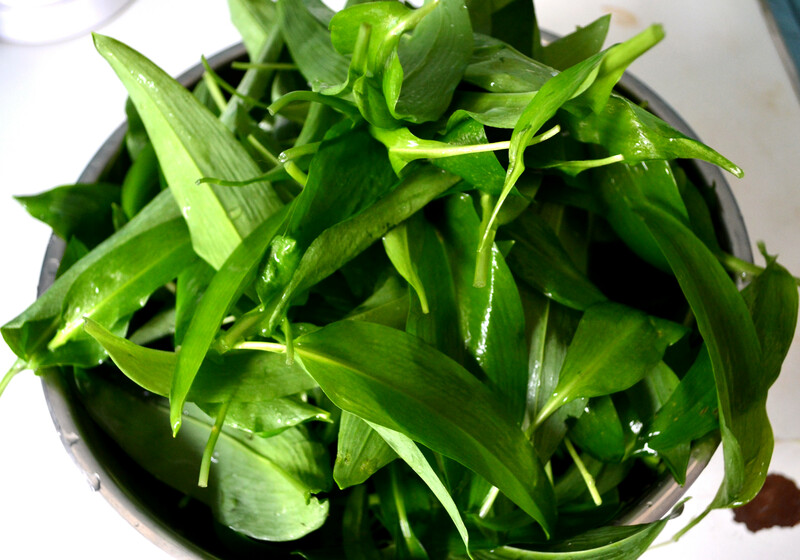 Wild garlic, called wild leeks or ramps in the United States, is annoyingly but deservedly trendy. It is (a) delicious; (b) beautiful; and (c) did I mention delicious? As I discovered, it also freezes beautifully; although the leaves lose their structural integrity, they maintain their colour and pungent flavour. To freeze wild garlic, simply chop finely or puree in a food processor, pack in a Tupperware, and pop in your freezer. Perhaps, like me, you were lucky enough to “find” wild garlic actually growing wild, and you greedily picked way more than you could possibly use at once. (It still counts as finding it if someone else found it first and showed you where, right?) Or maybe you bought a bunch at a Farmers Market, used some leaves in a recipe, and now are wondering what the heck to do with the rest. Or maybe you just need a little inspiration. Whatever your need, here are three lovely things to do with wild garlic when you’re at a loss. For what it’s worth, all of these recipes were made using wild garlic that I had previously frozen. Combine all ingredients in a bowl and allow to stand for at least an hour so the flavours can soften and meld. Taste and adjust seasonings. It is tasty, versatile stuff. 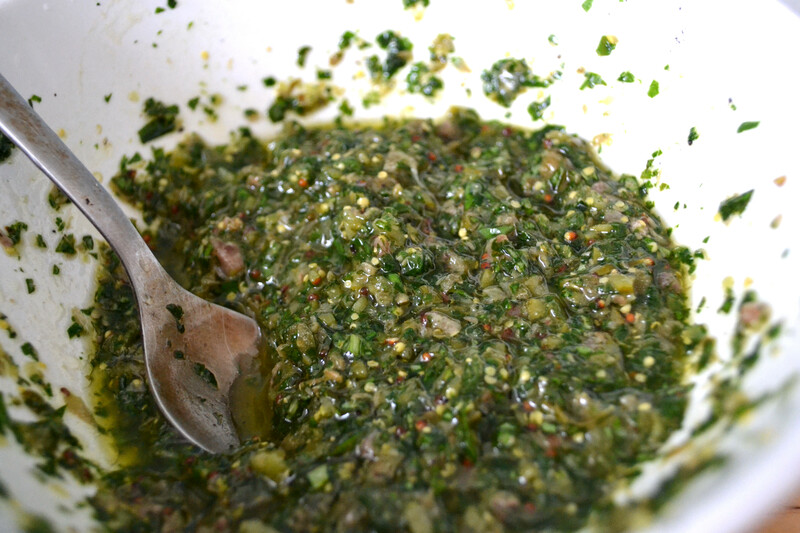 I served this salsa verde with steak (delicious!) and with crispy skin bream and mashed potatoes (even more delicious!). It should keep for about a week in your fridge. Makes approximately one cup of salsa verde. 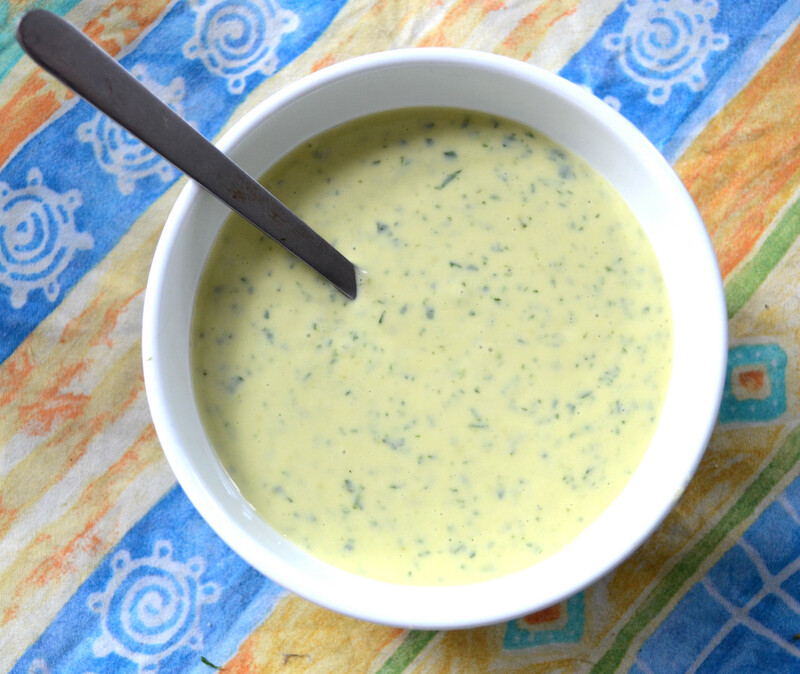 Here is a link to an earlier post on how to make aioli. Follow those instructions, adding the wild garlic at the end. I served this with sautéed calamari, but it would be a nice accompaniment to any other fish, fried potatoes, or, if you want to get really French about it, alongside roast chicken. This makes about a cup and a quarter of aioli. Here is a link to my standard fresh pasta recipe. To make wild garlic fresh pasta, stir two tablespoons of very finely minced wild garlic into the flour before incorporating the eggs. 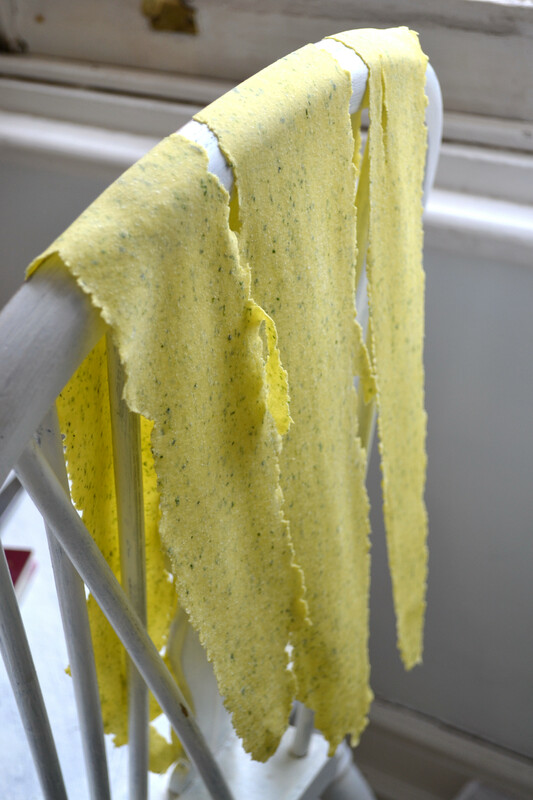 You will wind up with a lovely greenish flecked pasta dough. The dough is a little bit less supple and more inclined to tear than ordinary pasta dough, so use less flour when rolling it out. I made this pasta into ravioli (there will be a ravioli post anon) and because it was so delicious, I tore up the trimmings and froze those separately. This “shape” is sometimes called stracciatella (stracciatto literally means torn apart), and it is great with hearty sauces. Enjoy the wild garlic season! And because it is whiffy, be sure to consume with your nearest and dearest. 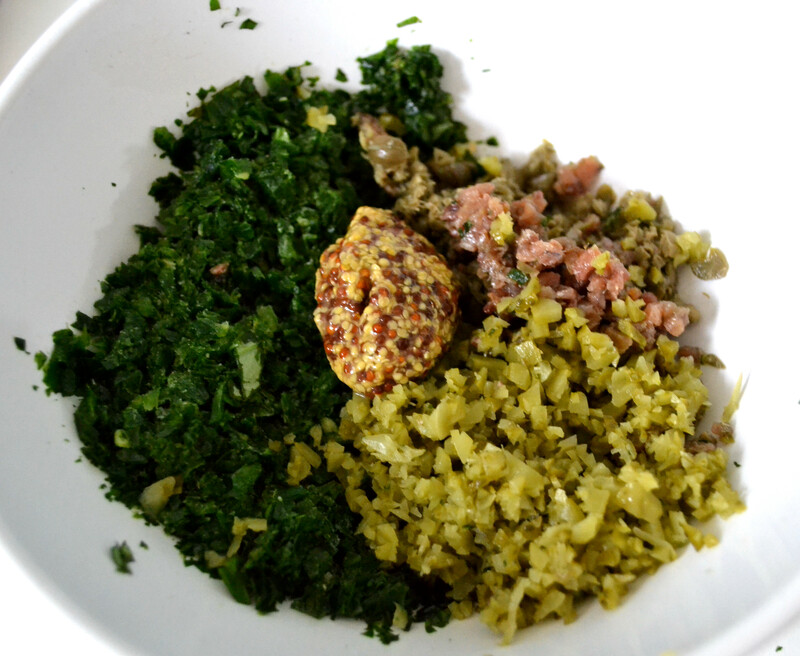 This entry was posted in Condiments, Marinades, and Sauces, Methods and Essentials, Recipes and tagged aioli, Easy, Pasta, Quick, salsa verde, vegetarian, Wild garlic by Susan. Bookmark the permalink. I love every single one of these ideas! The salsa verde is genius! So is the aioli. And the pasta. Okay, it’s all just genius! And such a great way to use such a delicious plant. I never thought of freezing it, but it’s a terrific idea to have a little bit of spring last a little longer! Yet another fantastically creative and inspiring post. I just joined a CSA so I’ll be looking for recipes! I don’t know everything they grow but my first pick up (which was yesterday) had lots of great greens, leeks, radishes, shallots and winter squash. Yay! Side note I’m guessing you mean juice from 1/2 large or 1 small lemon for the salsa verde? Good catch on the lemons! I have fixed it. And I am *SO* envious of your CSA — I really miss the one I had in Seattle. Hopefully you get some wild garlic! Hi Susan, 3 great ideas. 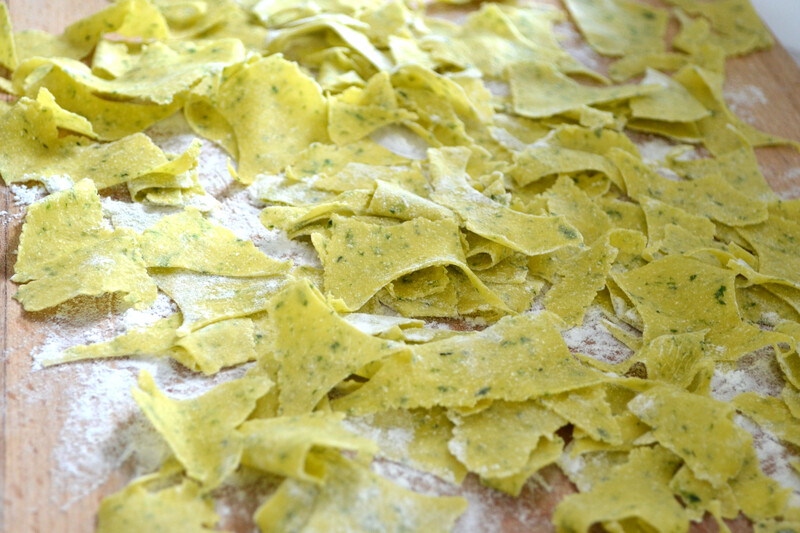 I love the fresh pasta, it looks so yummy with the green specks of tge wild garlic. Do you know i have never had wikd garlic, where can i get it from? Thanks for another mouth watering blog. Hi there Kris – thanks for this nice comment! You are in the UK I believe … you can find wild garlic at Farmers Markets (it’s in season until June) or you can forage for it. It likes shady places and sandy soil. Our ramp season was fleeting this year. I found them for sale only once. Great ideas all. There’s always next year (unless Spring 2013 is even stranger than Spring 2012 has been). Oh, and I love your pasta drying chair! Here it is FREEZING which is crappy in general but means our ramp season is still going strong. I love my pasta drying chair too! SO much more practical and economical than a finicky wooden contraption. wow susan! I see you’ve put your foraged wild garlic to good use. LOVE all that you’ve done with wild garlic, esp the fresh pasta! there’s a chinese dish of handtorn noodles too, it’s just a very homestyle dish we do at home with my mum, just roughly torn and then dropped straight into boiling stock, yum! I think I’ve seen your handtorn pasta recipe — you did one with sourdough, right? Delicious! I agree with bacon buiscuit!!! And some nice photos too!! PS loving the twitter pic, hair looks like it took a while!! !